Due to the tremendous response for BlogrCart White2 Blogger store shopping cart ready template, we have installed an automated theme tour to help users to get more insights for this specific template. Since that BlogrCart White2 comes pre-installed with many e-commerce featured functionalities, sometimes it would be hard to know what add-on functions has been incorporated. 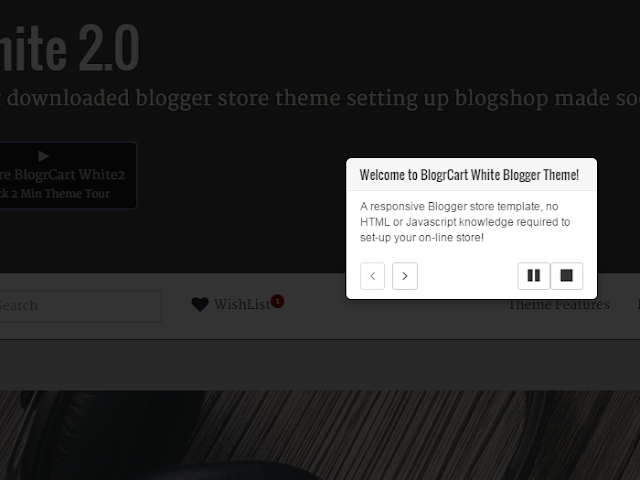 This 2 minute theme tour shows the many features that BlogrCart White2 Blogger store template has to offer. The demo itself is packed with the many e-commerce like functions which store owners can customize without touching a single code! We hope that the team at +Irsah inDesigns could have time to install this feature to the other Blogger store templates & themes demo in our collection. It helped build momentum for BlogrCart White2 Pro downloads version - and certainly would help out the other themes in our collection as well. If you like us to add this function to your existing Blogger blog, contact us here & we would gladly assist. Setting up a web/blog tour makes it easy to showcase your website's features to 1st time visitors, and display what your website (or Blogger store) has to offer. It helped our Blogger store theme/template downloads (and off course sales), and can wonder what it can do for your on-line Blogger store?